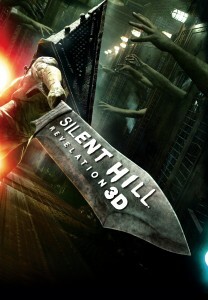 If we learned only one thing from the original Silent Hill film it is this; Don’t go to Silent Hill. Unfortunately despite being told this one thing quite frequently by her loving Dad (Sean Bean) young Heather didn’t seem to grasp the seriousness of it all. Upon waking one day from a bad dream (a double bad dream actually) that is all sorts of ominous and scary, Heather heads into the kitchen for a morning pick me up and a chat with dear old Dad. Dad then produces an unexpected gift – of the exact same article of clothing Heather just wore in her nasty dream – and furthermore replicates entire sections of the dream dialogue. C/ Say ‘thanks Pop!’, then immediately put on the top and head out for what will undoubtedly be a great day. …Of course Heather chose C.
Heather is only the most recent alias used by Sharon since the events of the original film, with her father moving from one town to the next every couple of years to stay out of the spotlight and off the radar, lest the Silent Hill posse track them down. Dad has sworn to wife Rose (who went missing after the first film) that he would not let any harm befall young Sharon (hereafter back to Heather). He has also opted to not inform young Heather of the truth behind these acts, allowing her to think that they are on the run because Dad killed a guy in another town. Meanwhile Sharon Heather has creepy visions while both asleep and awake of disconcerting characters and events, and no real reason as to why. Then one day Dad vanishes, with only a short message scrawled in blood as a clue to his whereabouts; “Come to Silent Hill”. Which might well be the sloppiest tourism campaign ever. But whaddya know it works! So after a good 30 seconds consideration Heather is off riding shotgun alongside Vincent, a young boy from her class who she met only hours earlier, that she asked to tag along only because he can drive. Once in Silent Hill the film becomes a series of 3 minute cameos as characters, monsters and… things all seem to appear to either impede Heather, provide us with plot exposition – or both – before scuttling, shuffling or bleeding on their merry way. In the last 40 odd minutes Heather has more 2 minute conversations with people that she has only just met than an emcee at a Miss Universe personality contest. And like the first flick it’s all creaks, blinking lights, rattles and mannequin spiders – though to be fair they have put a creepy amusement park in since last visit. Maybe they should’ve added that to the ad; “Come to Silent Hill – now with the creepiest Amusement park in the mid West or you keep your soul”. I can’t really work out what the revelation was, though I can confirm it wasn’t that Silent Hill 2 is a good film. As best as I can ascertain it is that Heather/Sharon is the ‘golden child’ for a group of religious zealots who want to use her as a ‘vessel for the god Alessa’. At one point a character says “Take us as far away as you can (from Silent Hill)”. My only advice is that you do the same. Final Rating – 5 / 10. Deliberately dark and unsettling, but I don’t think they set out to make it this crappy, confusing and pointless.